In addition to introducing Scott Servais, the Mariners announced four coaching staff additions, including newcomers Mel Stottlemyre Jr.and Tim Bogar. The Mariners Monday introduced Scott Servais as the club’s 17th full-time manager and announced four coaching staff assignments for the 2016 season, naming Tim Bogar bench coach, Edgar Martinez hitting coach, Mel Stottlemyre Jr. pitching coach and Chris Woodward first base coach. Bogar and Stottlemyre are new, Martinez and Woodward holdovers from Lloyd McClendon’s staff. The 48-year-old Bogar spent 2015 as a special assistant to the GM of the Los Angeles Angels under Dipoto. In 2014, he served as the Texas Rangers’ bench coach and interim manager, replacing Ron Washington. During his time as Rangers manager, he was 14-8. Bogar spent four seasons (2009-12) with the Boston Red Sox, serving as bench coach (2012), third base coach (2010-11) and first base coach (2009). Bogar owns a 362-266 (.576) career record as a minor league manager in the organizations of the Indians (2006-07), Astros (2004-05) and Angels (2013). Bogar had a nine-year major career with the Mets (1993-96), Houston (1997-00) and Dodgers (2001), primarily as a shortstop. He was selected by the Mets in the eighth round of the 1987 June draft out of Eastern Illinois University. Martinez returns to the coaching staff after being named hitting coach June 21. After he took over, the Mariners ranked third in the American League in slugging percentage (.437) and fourth in home runs (130), extra-base hits (305) and OPS (.758) over the final 94 games of the season, batting .260 with 426 runs scored. Martinez had an 18-year playing career, all with the Mariners. He was enshrined in the club’s Hall of Fame in 2007. Stottlemyre spent the past 13 years with Arizona, most recently as its bullpen coach (2014-15) following stints as its minor league pitching coordinator (2011-13), major league pitching coach (2009-10), minor league pitching coordinator (2007-09), and minor league pitching coach with affiliates in Missoula (2005-06), El Paso (2004), Lancaster (2003) and Yakima (2002). The Yakima native began his coaching career as the pitching coach at the University of Nevada-Las Vegas in 2001. He pitched six minor league seasons in the Houston (1985-87) and Kansas City (1987-90) organizations, combining to go 25-24 with a 3.50 with 24 saves in 122 appearances, including 57 starts. 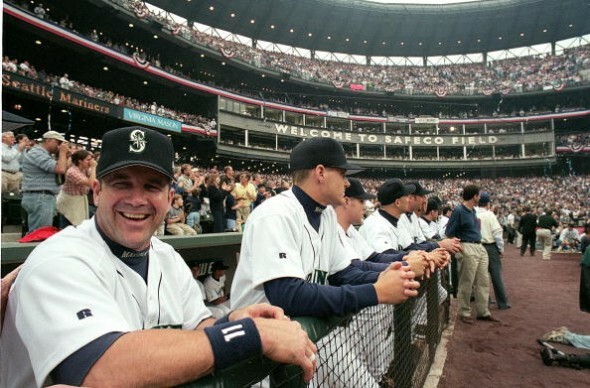 Woodward spent the past two seasons as a coach on the Mariners staff, including last season as first base coach. He began his coaching career with the Mariners in 2013 as the minor league infield coordinator after retiring from a 17-year professional baseball career. Woodward played nearly every position during his 12 seasons with Toronto (1999-04, ’11), New York Mets (2005-06), Atlanta (2007), Seattle (2009-10) and Boston Red (2009).